Our travel team has left for Zambia! EWB-BU members Grace Wang, Declan Bowman, and Nathanael Lee, in addition to mentor Mohammed Jafri of the Boston Professional Chapter, left for our pre-assessment trip on August 13. They plan to come back on the 27th. During the two weeks our team is in Zambia, there is a lot to get done! This is a pre-assessment trip, so our team will be looking to get a better understanding of Naluja, the community where our program has opened, and of its people. By sending our members to Zambia, we hope to pinpoint some of the problems the Naluja community is experiencing and start brainstorming projects that might be able to appease these needs. By the end, we hope to get a better sense about the needs of the community so we can figure out to best address them. Check back on our blog soon for more updates about what we’re doing in Naluja, Zambia! 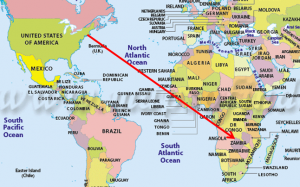 We’re really excited to be able to send members of EWB-BU to Zambia! The entire group has been working towards this goal for a very long time, so it’s very exciting to see all the hard work come to fruition. Thank you to our members for helping us reach this point! We wish our travel team the best of luck in Zambia!